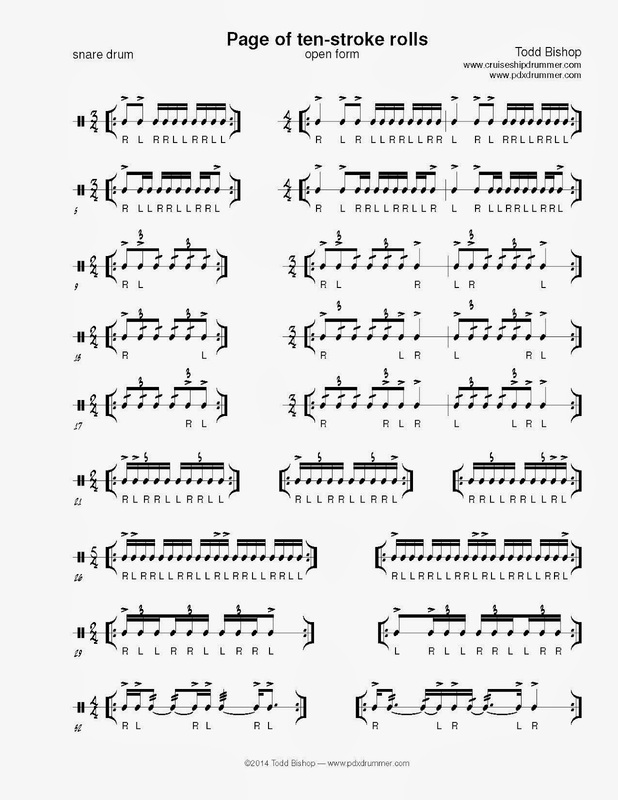 Here’s a pretty straightforward page of ten stroke rolls, open, in a variety of rhythms and meters. A ten stroke open roll consists of four doubles and two taps— one at the beginning and one at the end, or both at the end, or both at the beginning. In a few cases there is a third tap, which traditionally would make the thing into an eleven stroke roll— according to Wilcoxon, anyway— but I’m not going to go there; I’m reserving the eleven stroke name for a roll with five doubles and a tap. If you don’t have it already, my page of six stroke rolls is a good companion to this.